If you need assembly tools for your industrial operation in Dallas, Fort Worth, Kansas City, Wichita, or any other city in the Midwest, turn to the industrial tool experts at Wm. F. Hurst Co., LLC. 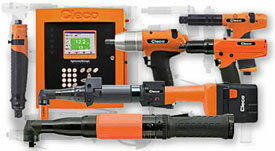 We’ve been in business since 1962, and are known for our unmatched offering of assembly tools from some of the most trusted names in the industry, like Cleco, Bosch Production Tools, and Desoutter. Our manufacturers are leaders in the assembly tool market and offer innovative technology for superior performance and dependability. Our expansive inventory also includes cutting tools, power tools, abrasives, and many other industrial tools and supplies. We can also provide professional repair for all of the tools we carry, as well as integrated supply systems that can help you better manage your inventory and reduce your operating costs. Our customer service staff is exceptionally responsive, so whether you are interested in updating your riveting system, or one of your tools needs a repair, we can work quickly to get you the service you need, when you need it. For more information about our selection of assembly tools and other industrial supplies, contact Hurst today. We proudly serve customers in Kansas City, Wichita, Dallas, Fort Worth and Other Midwest Cities.